Inspiring Art Teachers to Explore Art History | Curator’s Corner: Ooops! I've been at the art historian thing for a looooooonnnnnng time. So, it will be no surprise to you all that I came across a glaring error in our database of digital images. I received this image—gad! In the 1980s—and it came under the heading of actor prints. My completely substandard Japanese translation skills (I know that “mizu” means water), added to the farce. At the time we received this image, I had no access to online dictionaries that could help me translate the piece. But, now I know! This is not an actor print; it’s a public service announcement! 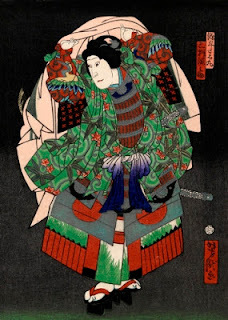 I have a major interest in Japanese art—especially color woodcut prints. And one can’t have that without an interest in Japanese culture, because the two are so intertwined. Measles was predominantly a Western disease that spread due to our forcible trade with Non-Western countries. 500,000 Hawaiians died from measles after the Western countries decided that it should be “civilized.” Who’s to know how many natives of Central and South America and Africa died from measles after being exposed to European “civilizers”? Japan was introduced to measles starting as early as the 1500s, when the Portuguese established trade with the country. This was cut off during the Edo Period (1615–1868), when the Japanese dictator feared a foreign takeover. They allowed foreigners (Western Europe and Australia) to deal through one port: Nagasaki. The final opening of the door of Japan, and the spread of measles there, came in 1854 when the US, under Admiral Perry, forcibly opened the ports of Japan to trade. After that, measles became a major health problem in Japan, much on the scale with smallpox in Western Europe and the US at the same time. 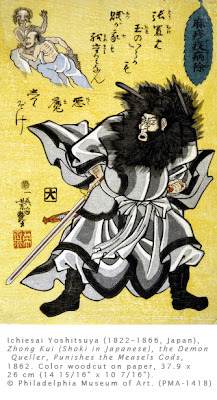 I’ve written about the Ukiyo-e style many times, but never realized the medium was also used for public service! This woodcut advertises the dangers of measles, and uses a deity to depict the eradication of measles, which they have translated into demons. When I received this labeled as an “actor print” I should have realized that the title Hashika Yakubyo Yoke was not a name, but the subject title. Look at other actor prints and I hope you’ll forgive my ignorance. It’s amazing how art history can open our eyes to the dissemination of information in other cultures. It’s fascinating that the Ukiyo-e style was not only used to popularize fashion and actors, but also to spread propaganda and news. Studio activity: Do a drawing that illustrates an illness in a humorous way. Decide what symbols are to be used to represent the illness, be it a human figure, a plant, or an animal. Using markers or colored pencils on 11 x 8 1/2" paper, depict a person either fighting or suffering from an everyday illness. Be sure to include details of how the person looks when he or she is sick.